So, I finally figured out how to add color using Photoshop Elements. Hurrah! I'm entirely too excited about how this first one turned out—not to mention the color combination, which is currently making me swoon. 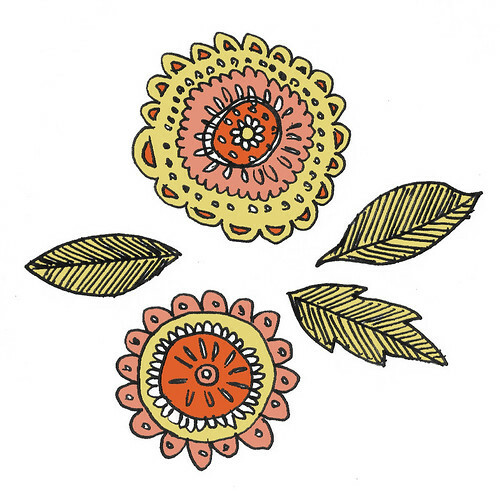 On white paper, I sketched these doily-ish flowers and leaves. I used a red gel pen for some reason. No idea why. It seemed like a good idea at the time. I scanned the image to my computer in color, then (using Photoshop Elements) I switched the colored image to black and white. Using Photoshop Elements, I sharpened the contrast and fiddled with a few other levels until the image was more crisp and less faded than the original scan. After that, I imported the image back into Photoshop Elements and started adding color by using the paint bucket tool. How did I not know it would be that easy? I mean, honestly. I feel like I still have to fine-tune this a little bit, but I'm eager to try it with more of my sketches and lettering and such. Not too shabby for a quick nap-time project, eh? Beautiful! You should sell your graphics. Very nice! Your tutorial isn't confusing at all! Very pretty and the tutorial is simple to follow. Thanks! I used Photoshop Elements for the first time the other day and had no idea what I was doing. I appreciate any tips or help I can get. Thanks for sharing this! Totally sell worthy - cute little prints need to be in your shop ASAP! I <3 Photoshop! :) cute doodles!